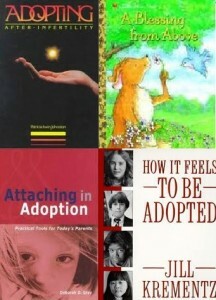 The following books are presented to help you prepare for your adoption. Reading the books is an important part of your home study and the reading should be completed by the time your home study is completed and ready for approval. They are available at most libraries and bookstores and some are available for check-out through our office. Required reading varies by social worker, office, and program, so contact your social worker regarding which books are required. Adopt Shoppe – unique adoption gifts, books, and resources. Focus on the Family – supporter of our Snowflakes program since July 1999. Tapestry Books – exclusively devoted to selling books on adoption. This is a great resource! !